”Vad händer när två svenskar blir betagna av ett eklektiskt husbåtssamhälle som guppar omkring i en by i norra delen av San Francisco-bukten? Originally a destination for free spirits, the community of over 400 floating homes has more recently been sustained by the ample wealth in the Bay Area. In addition to photo tours inside some of the houses, the book provides a light history of the community, including the so-called “Houseboat Wars” that took place when local authorities hoping to develop the waterfront tried to relocate the residents. 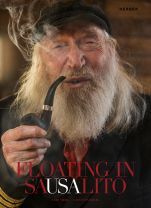 There are also interviews with key denizens, such as two nonagenarians who reside on a balloon barge that was once the home of Shel Silverstein. ”Åt alla som bär på tankar om att fly bort är den här boken den allra bästa julklappen.